An adventurer who hoped to become the first woman to trek solo and unsupported to the North Pole has abandoned her trip due to injury. Former marketing manager Hannah McKeand fell through ice and injured her leg, back and shoulder on Thursday, 14 days into her 480-mile (772km) quest. On Sunday the 34-year-old from Newbury, Berks, was picked up and is en-route to Ottawa, Canada, for medical care. 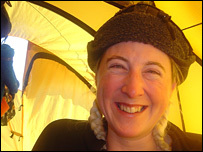 Ms McKeand holds the record for the fastest solo trek to the South Pole. A dispatch on her website read: "Without warning the snow gave way and Hannah fell sideways into a hole eight feet deep. "In the process she wrenched her left leg, hurt her lower back and left shoulder. "It took an hour for Hannah to work her way out and she then camped. "After medical advice and medication Hannah took Friday to rest and assess how she is. She is in considerable pain when moving - not ideal for sled pulling over hundreds of miles of frozen ocean." The journey, from Canada to the pole, has only been successfully completed once by British explorer Pen Hadow after three attempts.